Lapdog Creations: It's #NationalDogDay - Let's Celebrate! 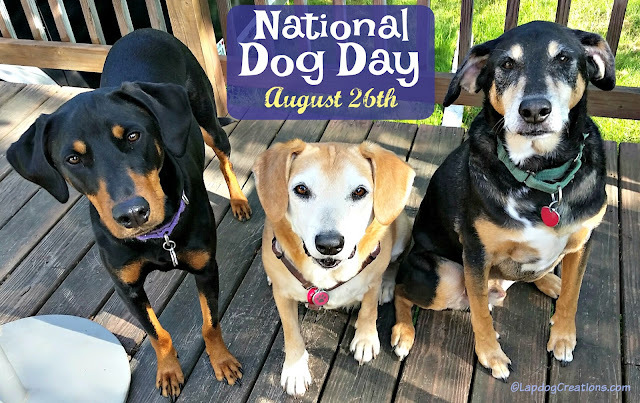 Yes, every day should be national dog day. However, today is not just about celebrating our love for our furry 4-legged kids, it is also about recognizing the number of dogs across the globe who are in need of rescue. I love that National Dog Day gives us pet parents an extra excuse to spoil our furkids as we celebrate the unique bond and unconditional love they provide to us each and every day. I also love that it provides extra exposure to the thousands of dogs in need of forever homes - including both mixed breed and purebred dogs. Rescue has always been near and dear to our hearts, and we have fostered and adopted several puppies and dogs over the years. For those who may not know, all of the Lapdogs are rescues - and they are all amazing. We'll be celebrating National Dog Day with some extra loving and treats today... and maybe even a fun adventure or two. We'll be playing and eating watermelon today. Around here every day is Dog Day. The Lapdogs are good at celebrating everything, and I"m sure Dog Day is a great celebration!